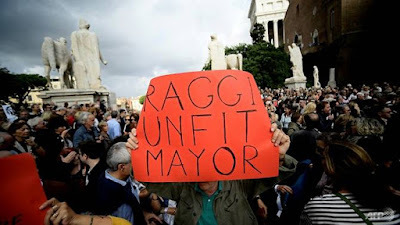 Thousands of protesters rallied in the centre of Rome Saturday over the Italian capital's decrepit infrastructure, as the legal woes of its mayor whetted political appetites on the far right. Holding strips of the orange plastic netting that city authorities place around potholes, fallen trees and dangerous pavements, the demonstrators said Virginia Raggi, the city's first female mayor, was responsible for Rome's pitiful transport service and woeful garbage collection. Raggi won the seat in 2016 for the anti-establishment Five Star Movement (M5S) with 67 percent of the vote, after both the traditional left and right-wing parties were seen to have failed to get to grips with a city drowning in debt. She has struggled to build a team or fix the problems she inherited and her popularity has plummeted.